Use this guide to elevate your stargazing beyond finding the Big Dipper. If you're camping, hiking or otherwise outside city limits this summer, Brenden Petracek advises you to look up. 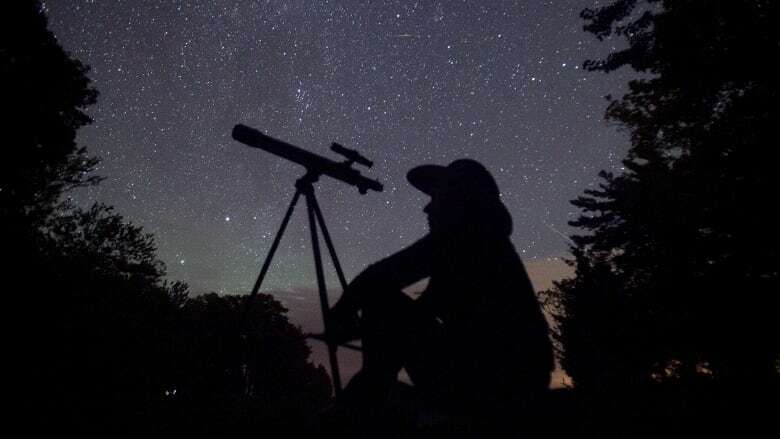 The president of Winnipeg's chapter of the Royal Astronomical Society of Canada says far from urban light pollution, the heavens are a sight to behold. They can be awe-inspiring, or even overwhelming if you're looking for something specific. For beginner stargazers, you might only know the Big Dipper, or maybe even the Perseids — the annual meteor shower in August. But if you want to elevate your stargazing beyond those this summer, Petracek and Manitoba Museum planetarium manager Scott Young have a few tips. There are some basics that will help you, like using a red filter over your flashlight — to preserve your eyes' night adaption — and bringing a star map your first few times. From there, Petracek said the first step is simple. "The best tip I can give is if it's clear and you're in a good, dark sky, take some time and look up. Be patient. You don't even necessarily need to know what you're looking at, but take some time, look up, and think about what you're looking at," he said. "Think about how far those stars are away, and think about how big the universe is, and just how small and lucky we are to be able to appreciate that." This is an asterism — that is, a star pattern that's not an official constellation (the Big Dipper also falls into that category — it's technically not a constellation, but part of the constellation Ursa Major). The Summer Triangle is made up of three stars in the shape of a huge triangle, "like a big slice of pizza," according to the Manitoba Museum's Young. 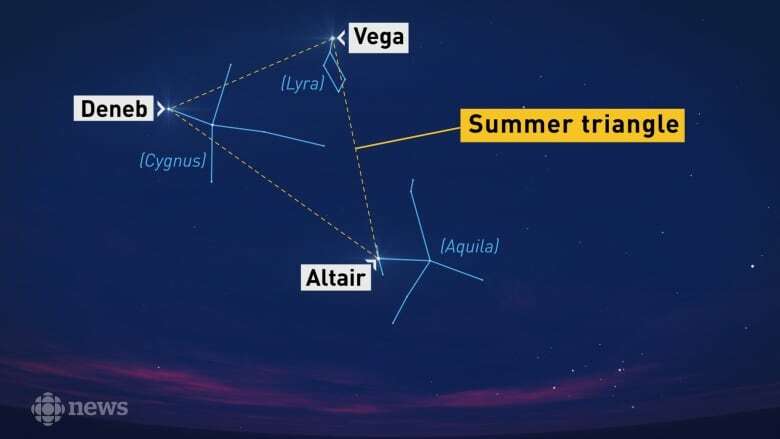 The triangle is a good place to start because it's easy to find in the summer, Young said: it's high overhead, pointing south and made of the three brightest stars in the summer sky — Altair, Deneb and Vega. All three stars in the triangle are also part of separate constellations that you can find once you've spotted the triangle. Deneb, the northernmost star in the triangle, is part of Cygnus the Swan. Cygnus is also called the Northern Cross for the large cross shape it makes, with Deneb at the top. Altair, the far point in the triangle (or the tip of the slice of pizza), is the head of Aquila the Eagle — a stingray-shaped configuration dropping down below the triangle. Vega, the brightest star in the triangle, is part of Young's personal favourite constellation, Lyra the Harp (or Lyre). Young likes this one because if you have a telescope you can find a wispy ring of light called the Ring Nebula inside it — a vision of the fate of our own sun roughly five billion years from now, when it runs out of gas. The Greek and Roman mythology surrounding constellations is often the most well-known, but Young said he likes the Chinese story of these stars the best. According to the tale, the two stars Altair and Vega are lovers, punished for their love by being split apart forever by a river — the Milky Way, which runs through the constellation. These stars aren't related, but they're all easy to find once you spot the Big Dipper. Contrary to some popular belief, the North Star — more officially called Polaris — is not the brightest star in the sky, Petracek said. 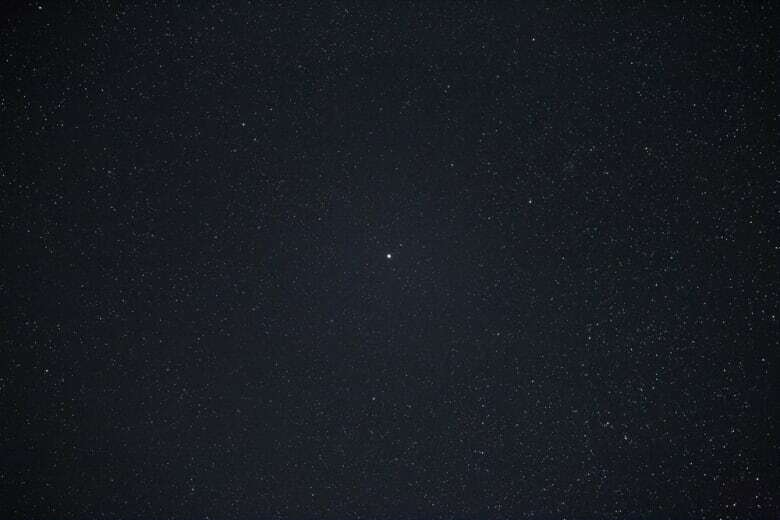 "The reason why Polaris is special is not because it's bright. It's special because it's stationary from our perspective." Finding it is helpful to get your bearings, because thanks to its location in relation to the Earth's axis, it stays put in the northern sky. "That's a good place to start. Knowing how to find the North Star is very important," said Petracek. To find it — other than just looking north — you can start by finding the Big Dipper and tracing the line formed by the two farthest stars in its cup, or bowl. Straight along from there, the first bright star you'll see is Polaris, which also happens to be the farthest star in the handle of the Little Dipper (also known as Ursa Minor, or the Little Bear). In a similar vein, you may have already heard a variation of the classic stargazer's catchphrase: arc to Arcturus, speed on to Spica. 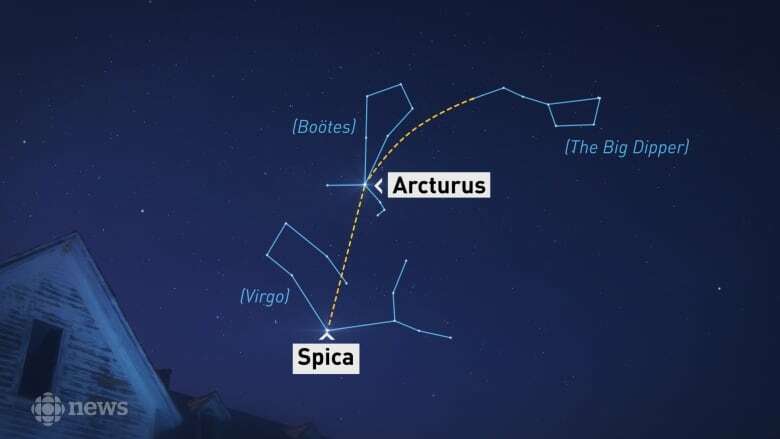 Following those instructions will help you find the constellations Bootes — which contains the star Arcturus — and Virgo, which contains Spica. Starting from the Big Dipper, follow the curve of the handle away from the Dipper until you spot a very bright star. That's Arcturus, the fourth-brightest star in the summer sky and the brightest star in the constellation Bootes, described variously as a herdsman, plowman or hunter. It's shaped roughly like a big kite, with Arcturus as the farthest point and a spur coming off each side of it. After tracing the curve of the Dipper's handle to Arcturus, follow roughly the same curve to Spica, another bright star and a point in the large constellation Virgo the Virgin. 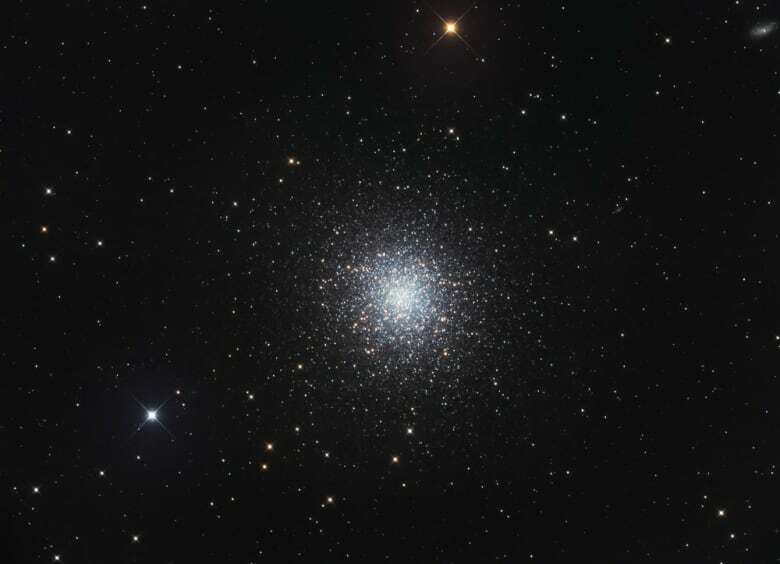 If the night sky conditions are exceptionally good, your naked eye might be able to see the distant grouping of more than 100,000 stars called Messier 13, otherwise known as the Great Globular Cluster in Hercules. Globular clusters in general are clusters of thousands upon thousands of old stars orbiting our Milky Way galaxy, although Petracek said there's still some debate about their origin. This particular cluster is one of the brightest visible in the northern hemisphere, according to NASA, and located within the constellation of Hercules, in between Lyra and Bootes. Grab a pair of binoculars and the cluster is magnificent, Petracek said. It's one of his favourites. "A globular cluster in a pair of binoculars would look kind of like a dense packet of light," Petracek said. "It won't be a point of light like a star is — stars are very obviously points of light. This globular cluster will kind of look like a bit of a fuzzy patch." Through a telescope, Petracek said it's phenomenal: like looking at a beach and being able to pick out grains of sand, or, in this case, stars. If you're looking at M13 anyway, you might as well check out Hercules, one of the few constellations Petracek thinks actually kind of looks like what it's supposed to resemble. This summer is a good opportunity for beginner stargazers because four bright planets will be visible in the night sky, as opposed to the usual one or two, Young said. "It's not particularly rare, it's just nice that it happens over the summertime when more people are going to be able to go out and watch the sky — at least comfortably," he said. Venus, Mars, Jupiter and Saturn will all be visible this summer, although Mars will be at its brightest later in the season when it's lower in the sky, and may be tougher to find if there are obstructions like trees. As the moon moves through the sky on its monthly cycle, it will draw attention to each planet as it passes by, Young added, usually sparking a number of curious phone calls to the planetarium. "The moon sort of cruises through the same area of the sky that the planets are in," he said. "But it's orbiting the Earth once a month, so it goes around the sky once a month, whereas the planets take much, much longer to move around." These flares aren't actually celestial phenomena, Young says. The brief, sudden flashes light up as cellphone satellites — specifically, those made by the communications company Iridium — rotate just the way right in the sky above us, catching sunlight on solar panels to make a bright reflection. "Basically this light sort of appears out of nowhere in the sky and brightens up to be brighter than all the stars and you'll see it moving slightly as the satellite orbits, and then it will suddenly fade away and disappear," Young said. "If you don't know what they are, they're kind of freaky." But the flares are predictable, Young says, because scientists already know how the satellites will behave. The flares happen fairly regularly, Young said, and you can find schedules for your area online.